I love cooking, but what’s even more fun is cooking together with a friend who loves to cook just as much as I do. Last week a friend of mine who is an excellent cook, baker and hostess suggested we prepare a dish together. She shared a lovely recipe for ratatouille spirals and within seconds we set a date and time to make them. As you may recall, for Bastille Day I cooked ratatouille, a popular summer dish in the Provence region of France. Now that the summer is about to end, it seemed appropriate to make it again, but with a twist, literally. 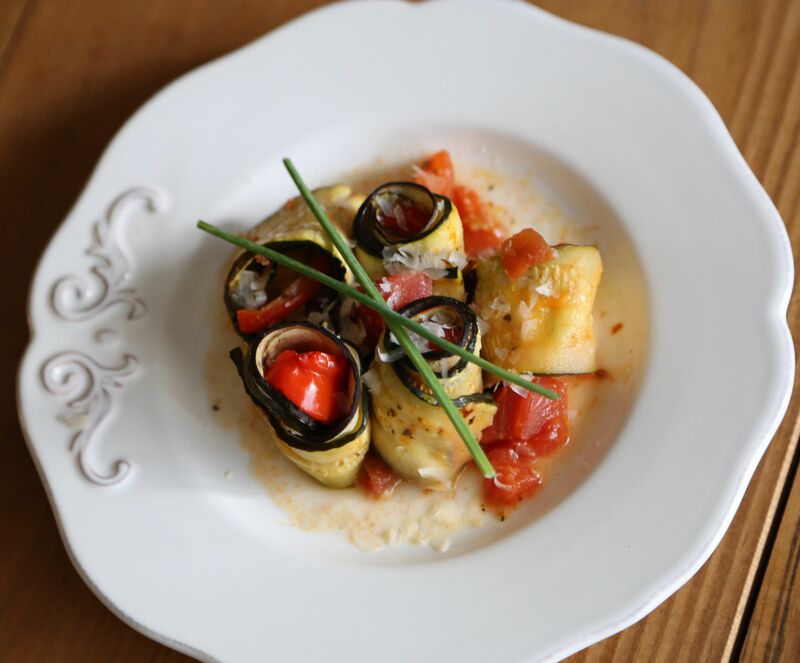 Ratatouille spirals are absolutely beautiful—bright and colorful little rolls of zucchini, eggplant, bell peppers and mozzarella, all baked in a fresh and zesty tomato sauce. These elegant ratatouille spirals were as much fun to make as they are enjoyable to eat. My friend and I both have little boys the same age—they were born about an hour apart. In between nursing, feeding, soothing and rocking the babies—before and during naptime—we sliced, chopped, peeled, rolled vegetables, and proudly prepared this gorgeous dish. I must admit, my friend did most of the chopping and rolling while I tried to feed my very hungry baby. Running back and forth between the kitchen counter and the table was like being on one of those fast paced cooking shows. We were busy but we both had a lot of fun! As a result, we very loosely followed the recipe below and it still turned out beautifully and delicious. While the spirals baked in the oven, my cooking partner had to quickly leave to pick up her daughter from school. Not long after, I noticed she had left a few things so I rushed out of my home, holding my baby in my arms, to try and catch her. As soon as I dashed out of my building, I bumped into another friend who saw me, fresh out of the kitchen still wearing a vintage apron and holding a baby still in pajamas in the middle of the afternoon. We laughed at the moment. She later said it was lovely to see me like that and said it seemed like I had just slipped out of an old Italian movie. I graciously took her comments as a compliment. An hour or so later, the ratatouille spirals turned out just as lovely and tasty as we had imagined. We were so pleased with our accomplishment—having fun while cooking a lovely dish and while caring for two babies—that we decided to cook together again soon. Later that evening, my husband liked the ratatouille spirals so much he asked when we would be having them again! In a medium pot of boiling water, blanch the tomatoes for 30 seconds; drain. Slip off the skins and halve the tomatoes crosswise. Coarsely chop the tomatoes, keeping the juices and seeds. Preheat the oven to 375°. In a large, deep skillet, heat 2 tablespoons of the oil. Add the garlic and crushed pepper and cook over moderate heat for 1 minute. Add the tomatoes and juices and season lightly with salt. Cook, stirring frequently, until the sauce has thickened, about 25 minutes. Meanwhile, on a baking sheet, toss the bread with the remaining 1 tablespoon of olive oil. Toast for about 15 minutes, stirring once, until golden. In 2 separate colanders, toss the zucchini and eggplant with 1 tablespoon of salt each and let drain for 15 minutes. Shake out the excess liquid and pat the slices dry. Spoon the tomato sauce into a shallow 2 1/2-quart baking dish and scatter the bread cubes on top. On a work surface, top each zucchini slice with a slice of eggplant; blot dry if necessary. Place a stick of mozzarella at one end of each stack and roll up. Stand the rolls in the baking dish and brush with oil. Cover with parchment paper. Bake for about 1 hour and 15 minutes, until the vegetables are just tender and the ratatouille is bubbling; remove the parchment halfway through baking. Let rest for 15 minutes before serving. Martine’s Notes: We loosely followed measurements while we cooked, adding more garlic here, red pepper there and slicing enough vegetables and making enough rolls to fit my 3-quart pan. All turned out very well! Also, it may help to secure the spirals with toothpicks, as you place them in your baking dish. Remember to remove them before baking! I hope you try this beautiful dish and have as much enjoyment preparing and eating it as as we did. If you do make this, please let me know. I’d love to hear about your adventures in the kitchen! Traditionally, ratatouille does not have cheese, so you can easily just skip the cheese! If I were making this dish again now, that’s what I would do. I don’t like vegan cheese so I wouldn’t use it. However, I heard the brand Kitehill, found exclusively at Whole Foods Market, is pretty good. I’m not speaking from experience because I haven’t tried their cheeses yet. Let me know how it works out! Good luck!